A new collection of critical and personal essays on the writing life, from National Book Award—winning and New York Times bestselling author Joyce Carol Oates. With this question, Joyce Carol Oates, in this new collection of seminal essays and criticism, begins an imaginative exploration of the writing life and all its attendant anxieties, joys, and futilities. Leading her quest is a desire to understand the source of the writer’s inspiration—do subjects haunt those that might bring them back to life until the writer submits? Or does something “happen” to us, a sudden ignition of a burning flame? Can the appearance of a muse-like Other bring about a writer’s best work? 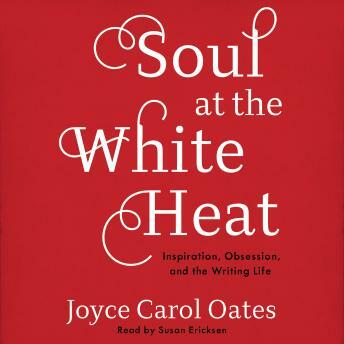 In Soul at the White Heat, Oates deploys her keenest critical faculties, conjuring contemporary and past voices whose work she deftly and creatively dissects for clues to these elusive questions. Virginia Woolf, John Updike, Emily Dickinson, Henry James, J. M. Coetzee, Margaret Atwood, Joan Didion, Zadie Smith, and many others appear as predecessors and peers—material through which Oates sifts in acting as literary detective, philosopher, and student. The book is at its most thrilling when watching the writer herself at work, and Oates provides rare insight into her own process, in candid, self-aware dispatches from the author’s writing room.